We recently moved from Kamloops to Abbotsford. We searched a lot of moving companies and decided on Blake's due to their overall superior ratings on BBB and other review sites. We were not disappointed. Shelly was professional from the day we first discussed our move with her. She was prompt with a quote. The inventory list on their website was very useful. The moving men arrived on time and were ready to work. They were prompt, courteous, friendly and hard working. They recommended some items go in our own vehicle due to possible breakage. They loaded everything quickly and respectfully. They arranged to deliver our items two days later in Abbotsford. That was fine with us. The truck and men arrived at the time specified and they got to work immediately. Nothing was broken and nothing was damaged. 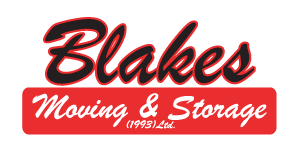 We are very pleased with Blake's and we recommend using them for any move. Thank you. I also put a review on BBB. I called last minute to have a piano moved and was able to arrange this seamlessly from another town between two locations that I would not be able to meet them at. Their friendly and quick service alleviated my stress of trying to organize this on my own. I strongly recommend them for all your moving needs. Blakes Moving provided an accurate quote and a stress free move for my family who moved to Kelowna. Shelly was great to deal with and prompt to answer questions and make changes as requested. I would recommend them. Their pre-move checklist for determining a quote was excellent as well. I recently moved from Saskatoon, Sask., to Prince George, B.C. 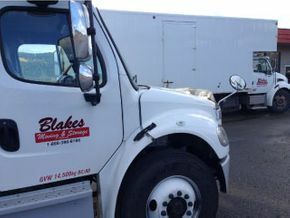 We used Blakes Moving & Storage based out of Williams Lake. This was the most pleasant experience I've ever had in a move: they were on time, courteous and made the move stress free. I would recommend Blakes moving and storage to anyone making a long distance move. What's more, their booking agent was incredibly helpful throughout the whole experience, Just great people all around. The move went very well, and I’d like to thank you for all your help. Hopefully we don’t have to move again anytime soon. However, when we do, we will definitely consider using your company again. I just wanted to let you know that our move went great. Everything went very smooth and stress free. Our belongings were handled with the utmost care, and we really appreciated that extra effort. The movers were very professional and friendly. Thank you very much for making our moving experience problem free. We will certainly recommend Blakes Moving to all our Cariboo friends. I’m thoroughly impressed with how everything went. And you’ve been super friendly and helpful, so easy to talk to. Great job! I’m more than happy to recommend your company to anyone. Superb experience for my first time around with a moving company, thank you so much! And thanks again for sticking to the quote. You guys have gone above and beyond the whole time. I made the right choice to go with your company. Sorry it took me an extra month and a half to get my act together. Having you guys take care of all the most stressful parts has been such an enormous relief! I really can’t say thanks enough! I wanted to communicate with you to convey Jan's and my gratitude and appreciation for the May 1, 2010 move from Williams Lake, BC to Regina, Saskatchewan that Blakes Moving & Storage undertook for us. As this was the second time we utilized your services, it only reinforced the complete satisfaction we experienced with the first move and our desire to have Blakes move us again. The personableness of yourself and the entire team, coupled with the professional service and customer satisfaction you deliver, has made both of our moves with you positive and successful experiences. Thank you. Should we require moving services again, without hesitation, Blakes Moving & Storage would receive that call.